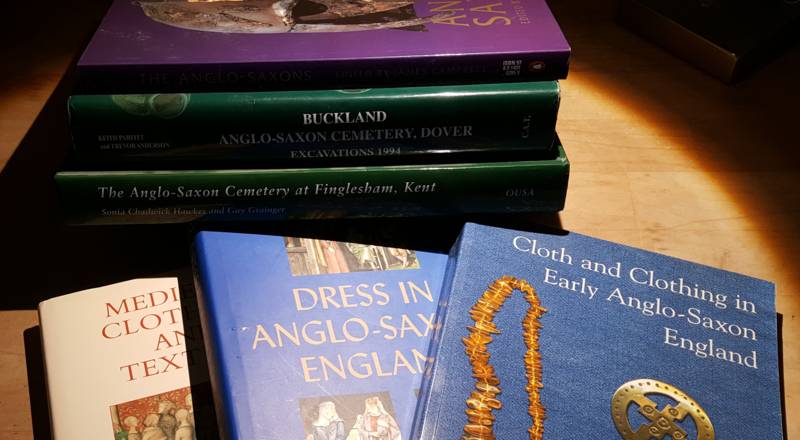 I’m currently researching 6th century Kentish Anglo-Saxon women’s clothing with a huge focus on what Penelope Walton Rogers refers to as Dress Style III and Dress Style IV. Dress Style III(in the picture) is described as “a garment with a vertical front opening clasped by two brooches, one at the throat the other centre-chest, and worn with a buckled belt.” For ease of reference I’m referring to this at “the tunic”. The image shown left is from page 190 of “Cloth and Clothing in Early Anglo-Saxon England”. It is a bit misleading since it seems to show some kind of trim along the front opening of the garment and at the wrists. So far evidence points to this not being the case. Or rather I cannot find any evidence of tablet weaving (or other trim) at the neck/front opening.. and I can’t find any evidence of anything at the wrists. – Longer than floor length. I’ve decided I don’t like the look of my tunics which are 3-4 inches above floor length (which usually happens when I cut them from selvedge to selvedge and add a shoulder seam). – Split down the front with a 1/4″ rolled hem on each side of the front opening. – Gore in center front and center back (for symmetry) as well as split gores on the sides. – Sleeves loose enough to push up to my elbow. I’ve looked, believe me I’ve looked. So far the only contemporary tunics where I can find enough information to infer a cutting pattern has been from the Bernuthsfeld Man (Wikipedia article in German) and burial clothing worn by Arnegunde (Queen Aregunda of Thoringia circa AD 500-561) or Bathilde/Bertille (Saint Balthild of Ascania circa AD 626-680). The Bernuthsfeld Man’s tunic is odd to say the least and I hesitate to use that as an example of a “normal” tunic. The only other published pattern I can find is for Bathilde’s Kaftan (the over jacket) which I may use for the “Frankish coat” but the pattern is not appropriate for this tunic layer. So instead since there’s currently no better option I’m going to base my cutting pattern on my tried-and-true tunic pattern (Quick&Dirty Peri-oid tunic: Sylvie’s Dress Pattern) with a few tweaks. First I want to cut the front/back in one piece, poncho style, and eliminate the shoulder seams. It seems that shoulder seams were a later evolution (10th c?) in tunic making. Second, my original dress pattern is actually very baggy there’s at least 8 inches of excess fabric there. With having the front slip opening I think I can and should make the tunic more narrow. In thinking about how to create and finish the front slit it occurs to me that it’d be easier to do if there was a gore inserted at front. So I’ll do a rolled hem on either side down to the point where a gore is inserted. Easy Peasy. Lastly, because I’m wider than the average medieval woman I want to nip in the shoulders to bring the shoulder seam to my shoulders instead of how it normally sits 3-4 inches down my arm (because I can). This is for my own comfort. This new cutting pattern takes about 4.5-5 yards of at least 57″ wide fabric. In researching the tunic layer I’ve come across a couple of references to some truely spiffy button loops used to hold the button brooches on either side of the front opening (at the collar and bust level). I think this topic deserves to be it’s own post (and I’m not yet done working on them) so I’ll post more about them later. That said, this tunic will have spiffy kentish button loops. Hello, it’s me again ! looking at your pattern I have a question. From what i read, there are no gores in western and northern Europe until the late 7th century when it seems to be allowed only to noble people. It might have spread socially in the late 8th century though we don’t seem to have archaeological evidences until late 10th. Would you have read or seen something supporting the existance of gores for our period ? I’m currently reading the excavation report of the Buckland cemetery in Dover and especially the Walton-Rogers study of the textile finds. she says that the central brooches have preserved traces of tablet weaving,mostly 2 holes or double-face, weaved with the fabric or sewed to it. it therefore supports the existence of decoration, or at least finishing tablet weave in the front opening. Also, in the cases where the starting tablet weave has been preserved, it runs along the left side of the body. the point where the fabric is fold to create the two sides of the body therefore wouldn’t be at the top but on the side of the body. There would then be stitches only along one side of the body, but it also means stitches on the shoulders. To me it sounds coherent with a dress without gores. In that case, the shortest length of fabric correspond to in the height of the person. The sarting of the weaving ( putting all the threads to the starting tablet weaved band ) beeing a long process, better make it the width of the fabric and not in the length. I found coptic tunics without shoulder stitches, but they seem to be weaved directly as tunics and not fabric cut down. sorry for the long and probably confusing post. As I told you, I’m currently working on my Kentish dress and this is where my reflexions have led to this day ( I may therefore completely change my mind this afternoon ). I’m quite new in the reenactment world and completely hopeless in the sewing department. I’m aiming, sending you those remarks to hear your ideas and have my ideas contradicted before it’s too late. Hi! I’ve been reading your blog for a while and have been enjoying your descriptions of projects and of interesting bits from your research. 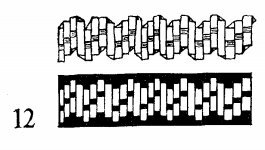 There’s an SCA member named Greet who made herself one of the long-slit Anglo-Saxon tunic that fastens with two brooches. I thought you’d be interested in seeing pictures of it. Her blog seems to be defunct but here’s a link to a picture of her wearing the finished tunic, with an explanatory caption: here. Best of luck with the Kentish tunic project!